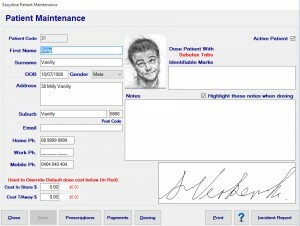 Adding a patient signature to their details must occur before the system will prompt for their signature when dosing. 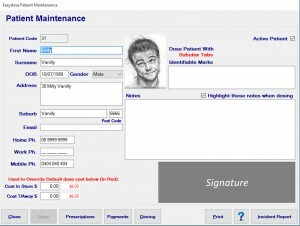 Even though the Signature Pad is present and is enabled in System Options, the system wilt prompt for a signature if a sample signature is not recorded against the individual patient. Note the ‘Greyed’ signature field on the bottom right of the form. 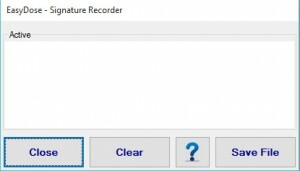 Click in the real area and a blank EasyDose – Signature recorder form will open. Request the patient to sign on the signature pad. If the signature is to be rejected, Clear and repeat until the desired signature has been obtained. 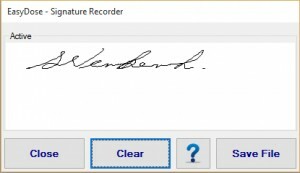 Once obtained, click Save File and that signature will be recorded against that patient as their original for comparison against. EasyDose © 2019. All Rights Reserved.